Trivial Pursuit is a board game in which progress is determined by a player’s ability to answer general knowledge and popular culture questions. The game was created in 1979 in the southern Spanish city of Nerja by Canadian Scott Abbott, a sports editor for The Canadian Press, and Chris Haney, a photo editor for Montreal’s The Gazette. After finding pieces of their Scrabble game missing, they decided to create their own game. With the help of John Haney and Ed Werner, they completed development of the game, which was released in 1982. In North America, the game’s popularity peaked in 1984, a year in which over 20 million games were sold. 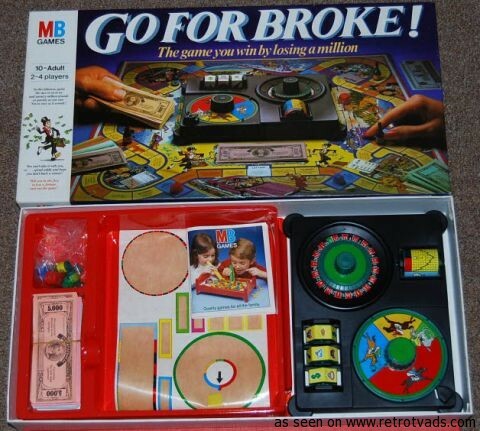 The rights to the game were licensed to Parker Brothers (now part of Hasbro) in 1988, after initially being turned down by the Virgin Group; in 2008, Hasbro bought out the rights in full, for US$80 million. As of 2004, nearly 88 million games had been sold in 26 countries and 17 languages. Northern Plastics of Elroy, Wisconsin produced 30,000,000 games between 1983 and 1985. 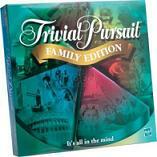 An online version of Trivial Pursuit was launched in September, 2003. I got this game years ago as a child – when playing board games was a great way of passing an otherwise boring Sunday afternoon when the rain poured down outside. This was kind of a family tradition without Playstations and the like to keep you amused, no DVDs and video rental was quite expensive at that time so this was a way to get us all involved in something fun. Looking back I can’t help but feel that kids of today really miss out on this fun family time together when you fight over who gets which coloured playing piece and try to outsmart your parents. Didn’t it feel great when you beat them. This game is still around today – although it is quite difficult to find in the shops and you will have more luck with an online search if interested. The likes of Amazon and Farscapegames.co.uk have it for around £10 new or you can pick it up second hand cheaper on eBay It involves a very strange philosophy – You have to lose to win so if you are always best at coming last then this is definitely the game for you. My Little Pony is a brand of toy ponies marketed primarily to young girls and produced by the toy manufacturer Hasbro. These ponies can be identified by their colourful bodies and manes, and typically a unique symbol or series of symbols on one or both sides of their haunches, the ponies are always named after the symbols on their haunches. Following the related My Pretty Pony toy, introduced in 1981, “My Little Pony” was launched in 1983. The line became immensely popular during the 80s, at one point even outselling Mattel’s Barbie. The original toy line ran from 1983 to 1995 (1992 in the U.S.) and inspired animated specials, including an animated feature length movie and two animated television series. The brand was relaunched between 1997 and 2003 (1999 in the U.S.), and then fully relaunched globally in 2003. My Little Pony celebrated its 25th Anniversary in 2008.